The Falkland Islands are between latitude 51? and 53?S and longitude 57? and 62?W in the southern Atlantic Ocean, 400 miles east of the tip of South America. It is an Independent Overseas Territory of the United Kingdom. This collection of over 740 islands is a treasure trove of sub-Antarctic species and other alpine and wind-adapted species. We visited one of the two main islands (East Falkland) and six outlying islands (Sea Lion, Bleaker, Carcass, West Point, Saunders, and Pebble) in January 2009. Our visit was 175 years after Charles Darwin spent more time in the Falklands than he did in the Galapagos. The islands did not become a tourist destination until a Linblad Expedition ship first visited in 1968. And they remain mostly just brief stops for those on cruise ships. Cruise ships now bring over 60,000 visitors each year. Less than 1000 people visit as land-based visitors for one to three week stays each year. As land-based visitors, flying between most islands, we spent more time with the very tolerant wildlife than can travelers from cruise ships. We enjoyed the hospitality and comfort of staying in cottages and lodges on the islands. The trip from Carcass Island to West Point Island was a full day trip by boat. All the islands we visited, except one, are sheep farms where wildlife and grazing are well integrated. Sea Lion Island is now a National Nature Reserve with no more sheep farming. Independent travelers can easily plan their own itineraries with the assistance of local Falkland Island travel agents. Photographers, birders and history buffs have much to see and do on these wind-swept islands. We traveled to the Falklands on the weekly flight from Santiago, Chile and stayed two weeks. 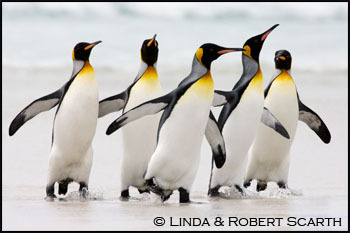 To see some sample images, click on the labels just above the King Penguins. We learned that walking with penguins is every bit as exciting as dancing with wolves.